Flo Hyman started her volleyball career at Morningside HS and El Camino College before accepting the first female athletic scholarship at the University of Houston to play for Ruth Nelson. She was the 1976 AIAW National Player of the Year and a 3-time All-American, plus inducted in 1998 into the Houston Hall of Fame. She then played for the USA National Team and was a 1980 Olympic member before the boycott while became a dominating international player. She led the USA to the 1984 Olympic Silver Medal, while being team captain and selected as the Games top hitter. She was also named the Best Attacker at the Pan-Am Games in 1975, 1979, and 1983, the NORCECA Championships in 1975, 1977, 1979, 1981 and 1983, and the World University Games in 1973 and 1977. She previously won a 1982 bronze medal at World Championships. She was All-World and Most Valuable Player in countless international tournaments. At the prime of her career at age 31 and playing an international match, she sadly passed away on the bench on January 24, 1986. The diagnosis was Marfan syndrome. She was selected by ‘Sports Illustrated’ among the top 100 athletes of century. 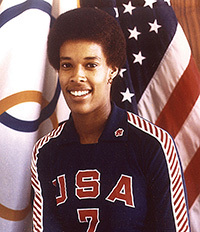 She was inducted into the Volleyball Hall of Fame in 1988 as well as being named as one of the ‘All-Time Great Volleyball Players’ by the USVBA. In 2017 she was inducted into the Texas Sports Hall of Fame as one of the first volleyball players.